Burgess Hill Town enjoyed a superb 3-0 home win against Merstham at the Green Elephants Stadium to give Simon Wormull his first league win as permanent head coach. Simon Wormull made three changes to the side who lost 1-0 to Kingstonian last Saturday, with new signings; Dan Choules, Brian Galach and Keano Deacon all handed their Hillians debuts. Merstham started brightly, striking the post in the 15th minute, as Osbourne’s cross deceived everyone. In the 23rd minute, Figueria’s snapshot rebounded back off James’ right-hand post - with the forward just managing to beat the offside trap. In the 29th minute the Hillians opened the scoring, as Michael Wilson’s delicious free-kick was met by James Richmond who side-footed the ball past the helpless Tangara. The first half ended with a save each from James and Tangara - as both sides continued to trade blows. The Hillians started the second half at a great tempo, with Deacon and Harding both forcing good saves out of Tangara. In the 62nd minute, Pope passed up a golden opportunity to double the Hillians’ lead, as he blasted high and wide from a promising position. Elphick defended outstandingly throughout, throwing himself in-front of every shot. 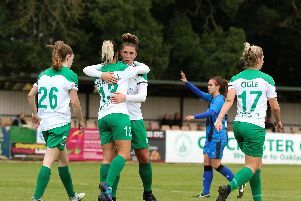 Two goals in two minutes fired the Hillians into a three goal lead, with Pope firing a thunderous free-kick into the top corner before Keano Deacon opened his Hillians account in stoppage time with a lovely finish. BURGESS HILL TOWN: James, Choules, Cadman, Wilson, Elphick, Richmond, Galach, Harding, Pope, Beck, Deacon. SUBS: Diallo, McCollin, Franzen-Jones, Bennett, Kipeya-Bonno.